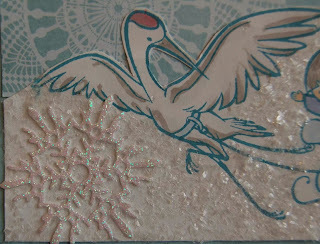 Today I'm showing you the inside of my card first because that's how I started this card. 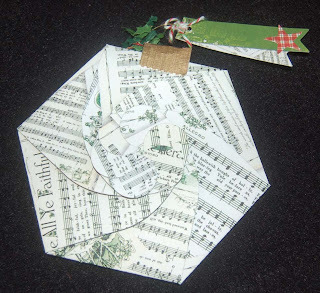 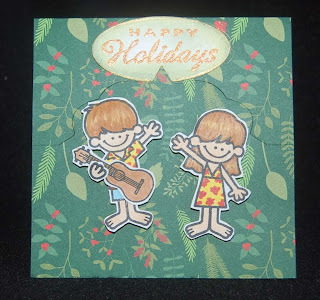 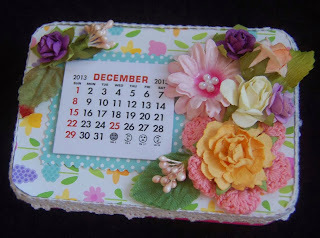 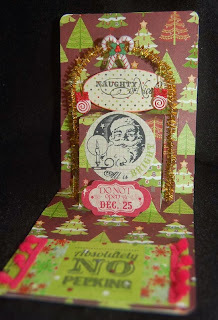 Well, actually this card started with a new die (label, Funky 3D pop-up) I purchased at Ben Franklin Crafts. 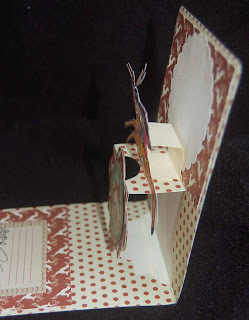 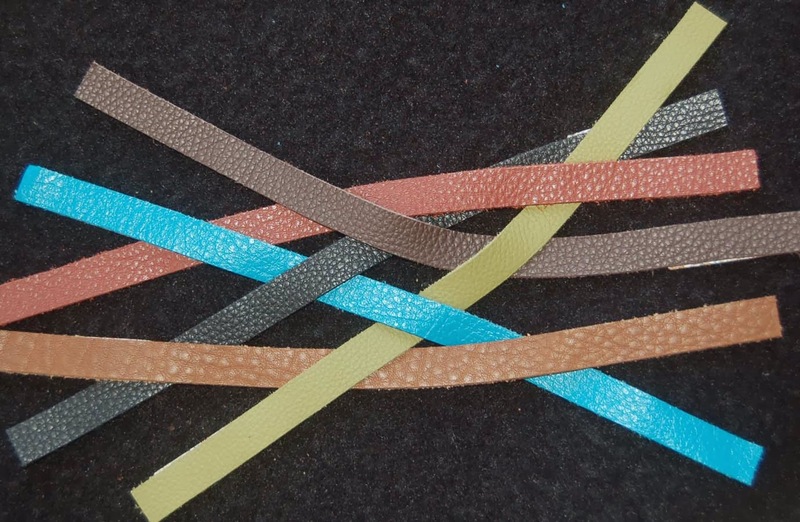 It is one of those dies that fit into the basic card shape die allowing you to cut many different pop-up cards simply by switching out the center pop-up part. After cutting the reindeer pattern paper (Authentique) upside-down ...TWICE, I decided to listen to the crafting gods and go with the flow. 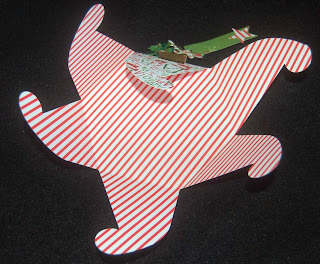 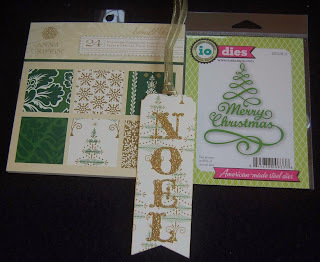 I reversed the card to show the dot pattern, cut up one of the 'mistake' cards and tape down the reindeer paper sections. 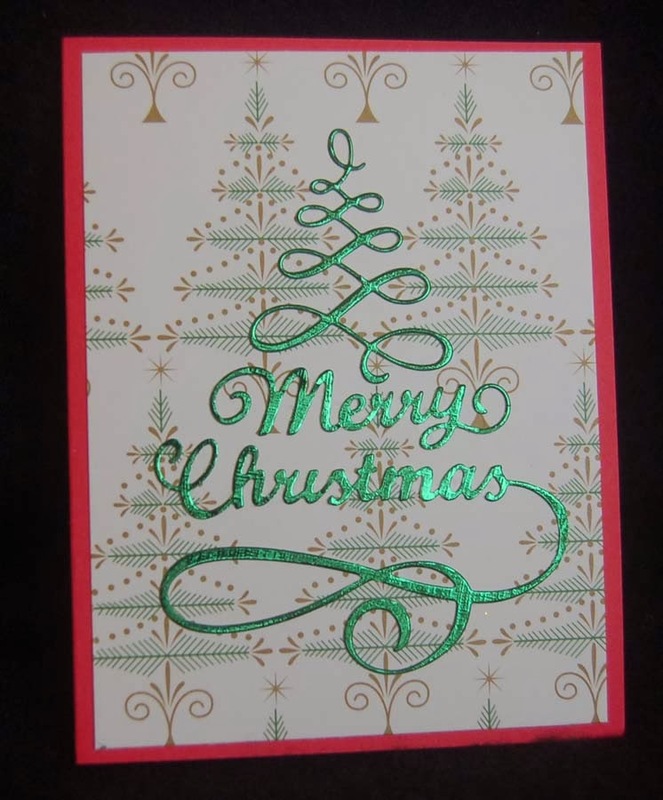 I think the result was a 'happy' mistake. 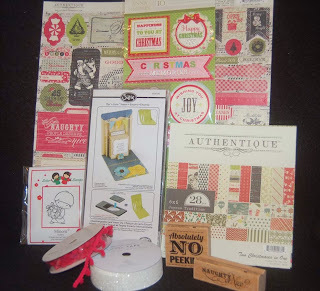 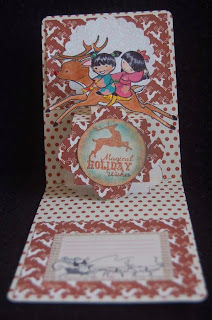 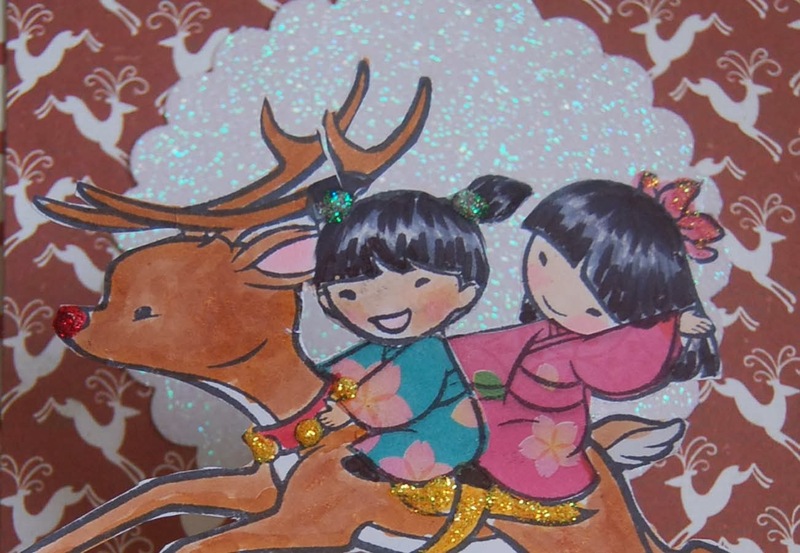 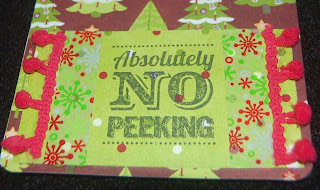 The only problem was that the Sister Stamp image that I colored did not stand out against the reddish reindeer paper. 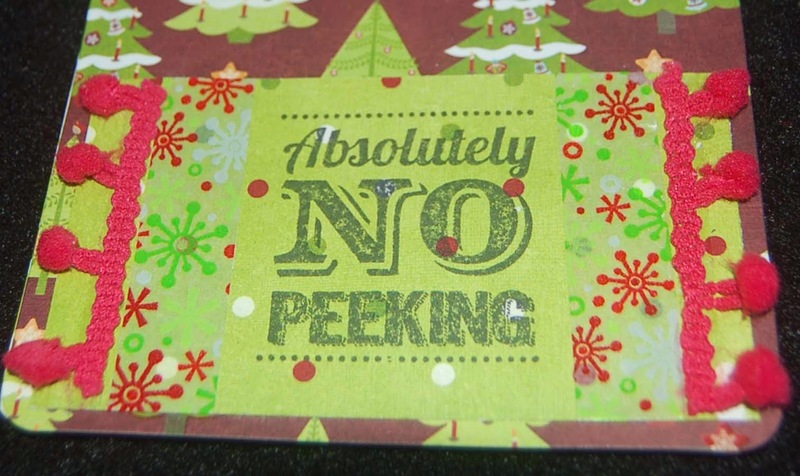 Since there was lots of room on the platform made by the pop-up label, I decided to make another pop-up part and adhere the SS image to it. 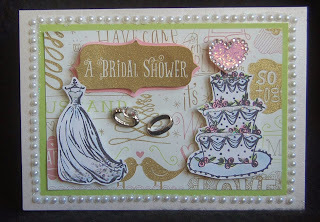 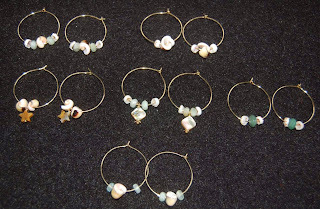 To further enhance the image I add a glittered scalloped circle in the background. 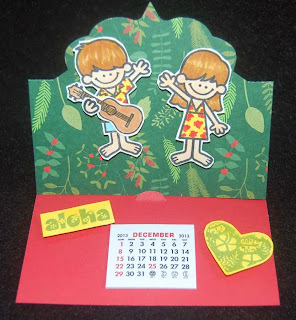 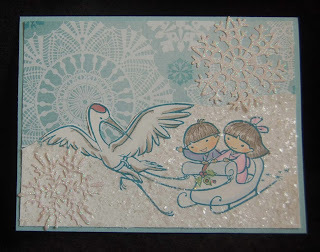 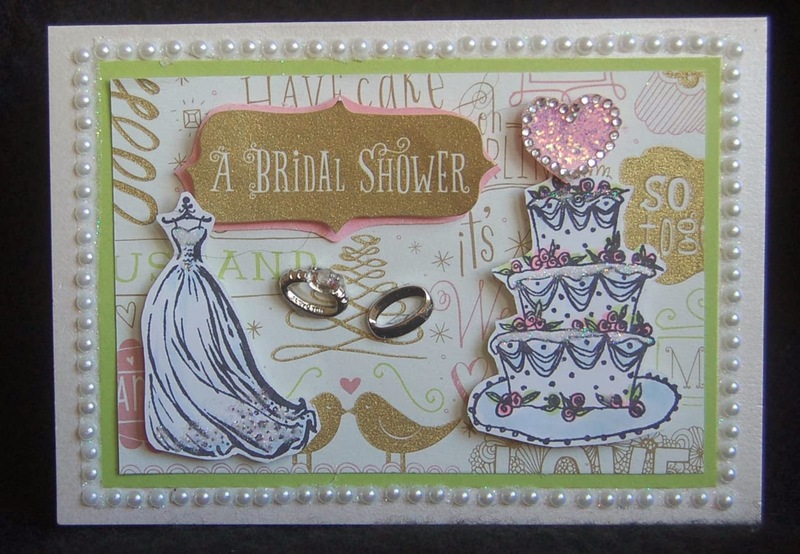 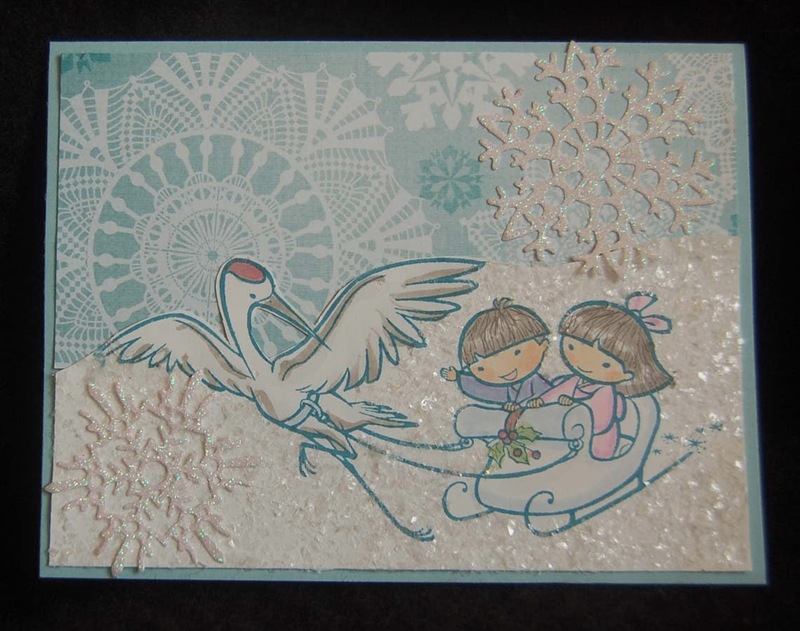 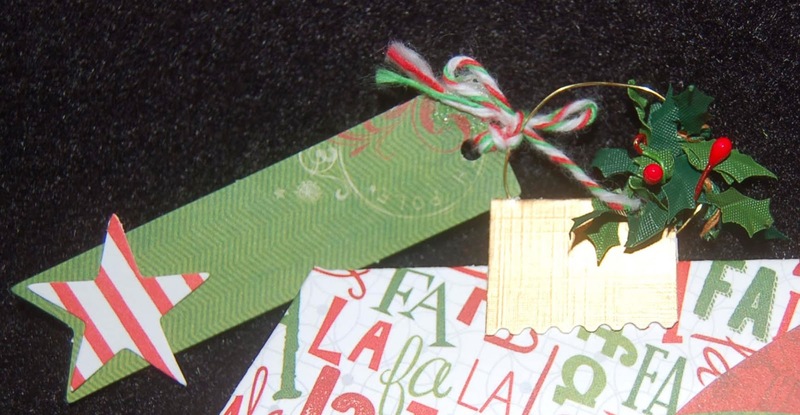 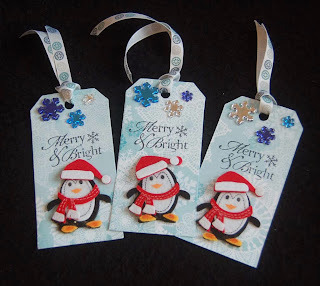 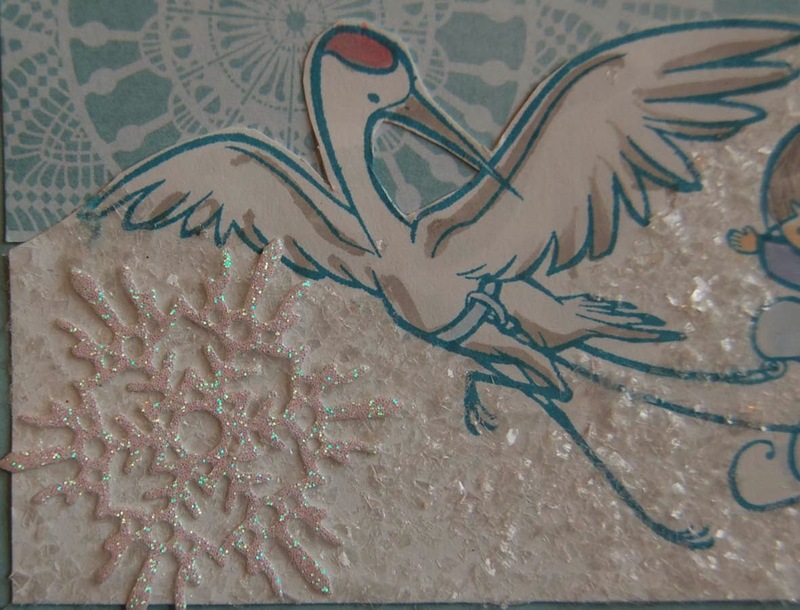 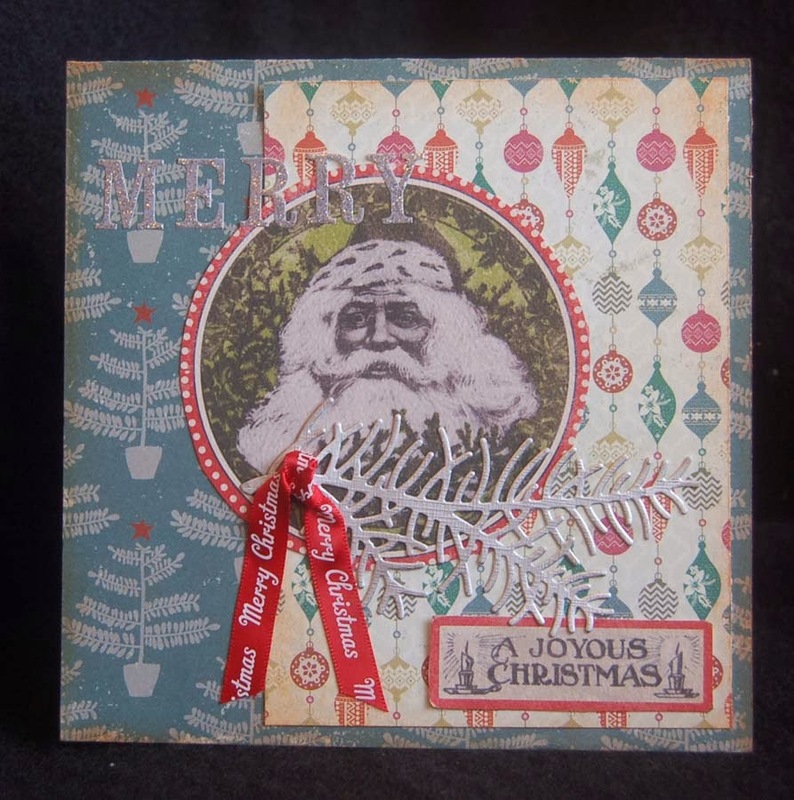 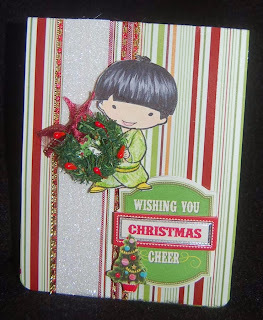 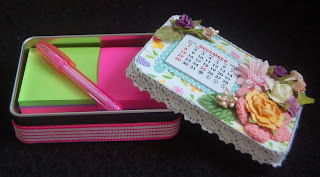 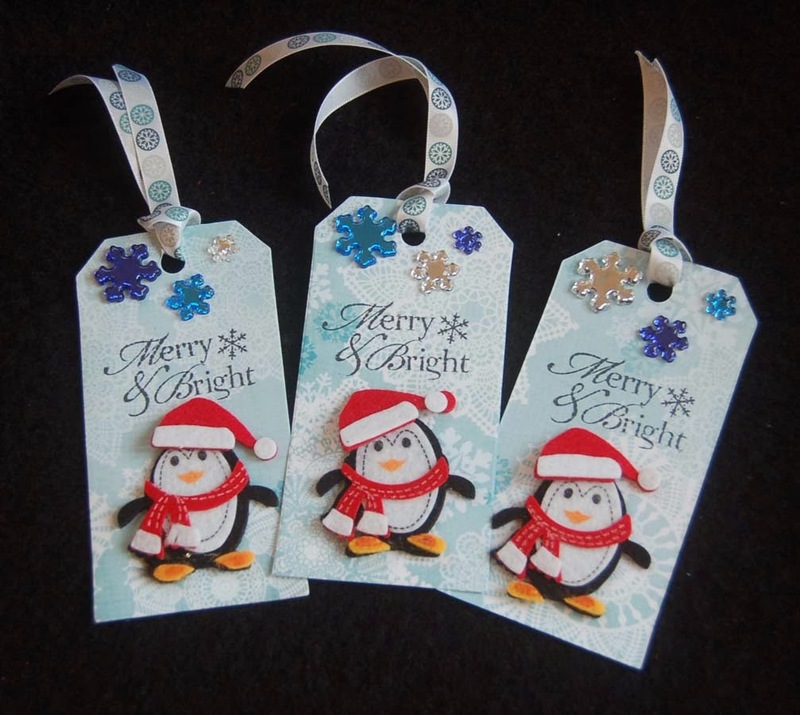 The glitter paper is from an American Crafts 6x6 paper pad (from BFC) and easily cuts with a paper punch. 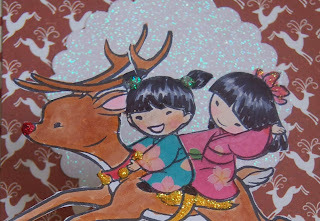 The SS image was colored with Copic pens and the kimonos were paper piece from the cutest pack of origami paper I found at BFC. 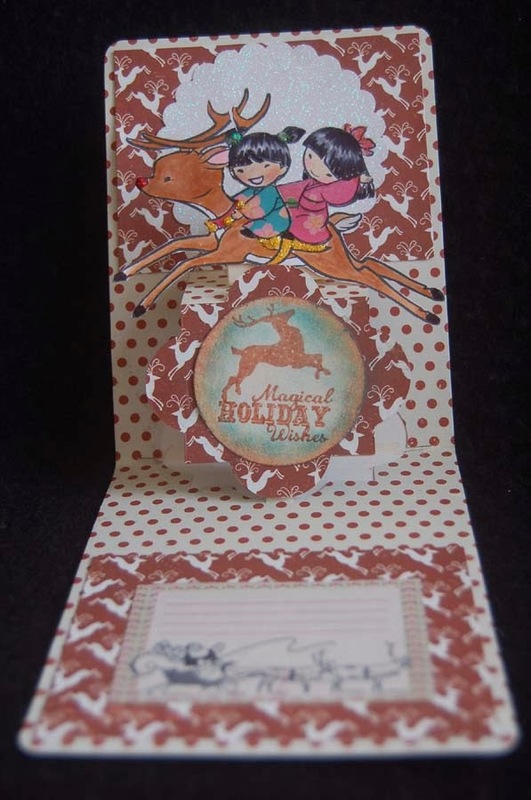 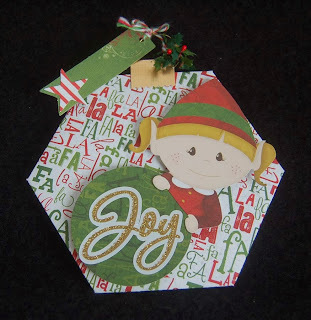 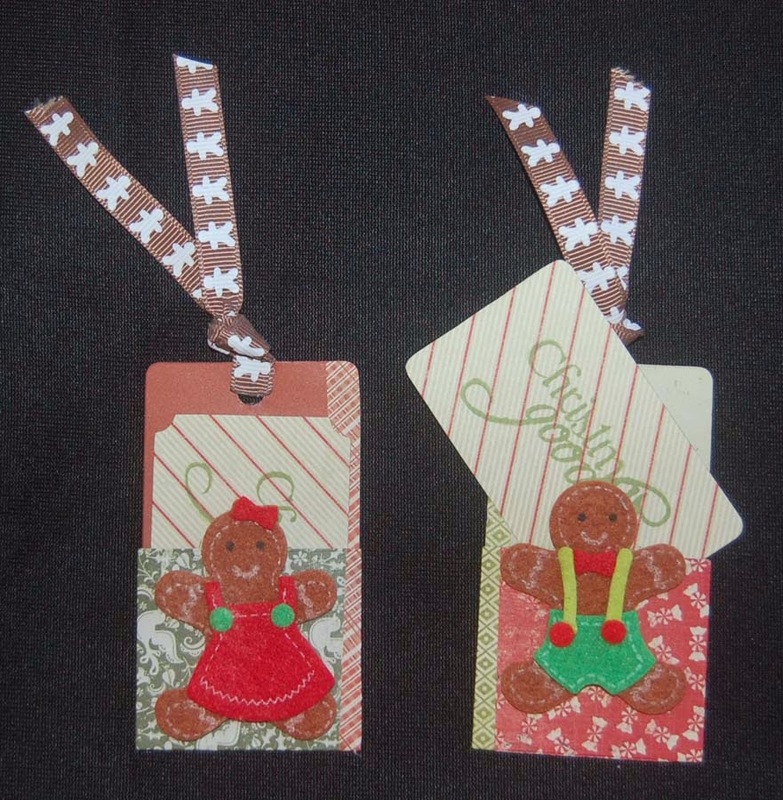 The Studio G reindeer stamp with sentiment was punched out and colored with ink and chalk. 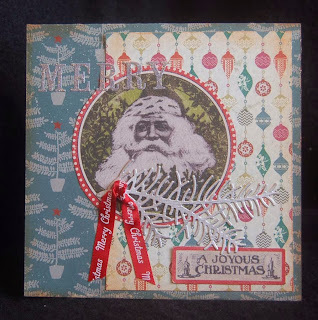 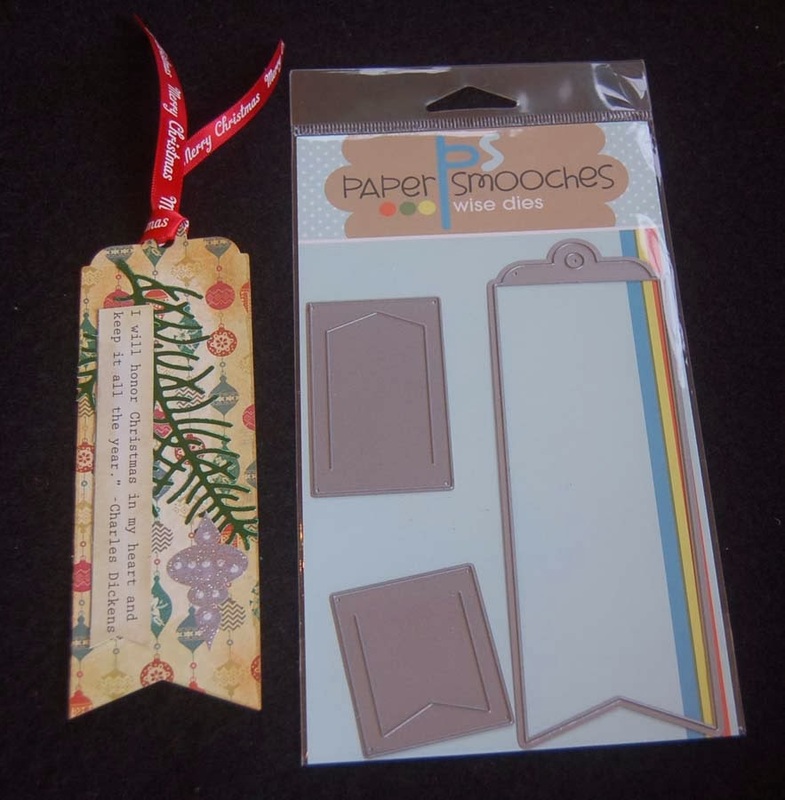 The Santa with sleigh is a sticker from an Authentique 12x12 sheet and was added to give a surface for writing a message. 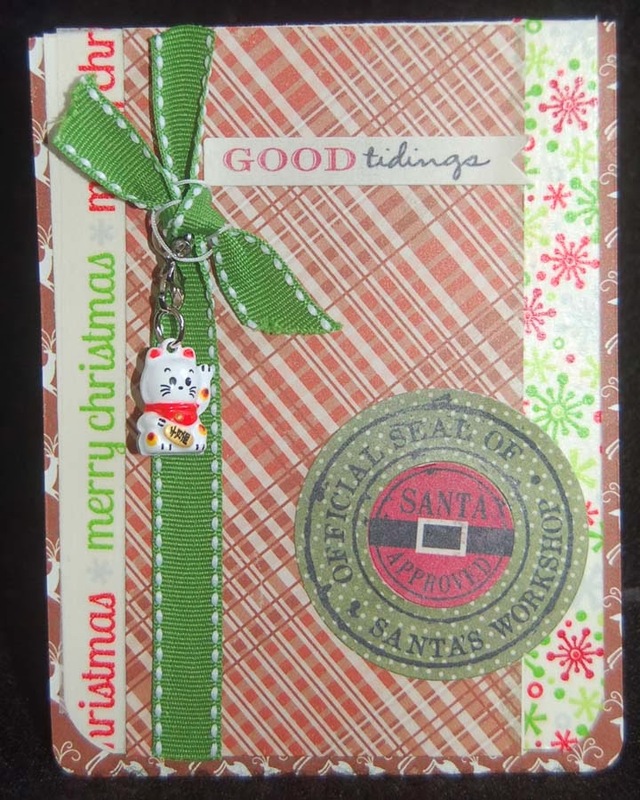 After finishing the inside of the card, I decided to keep the front simple so I added Doodlebug Xmas washi tape (lots of styles at BFC) and a panel of Authentique card stock. 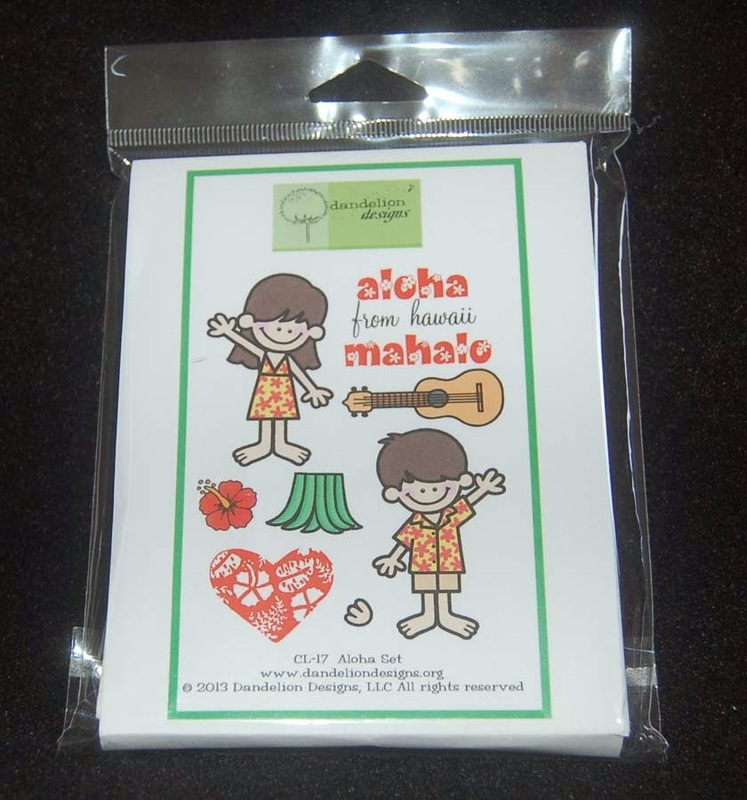 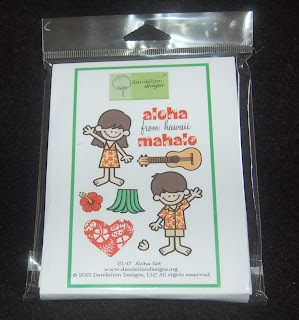 Authentique stickers from a 12x12 sheet were easy and fun add-ons. 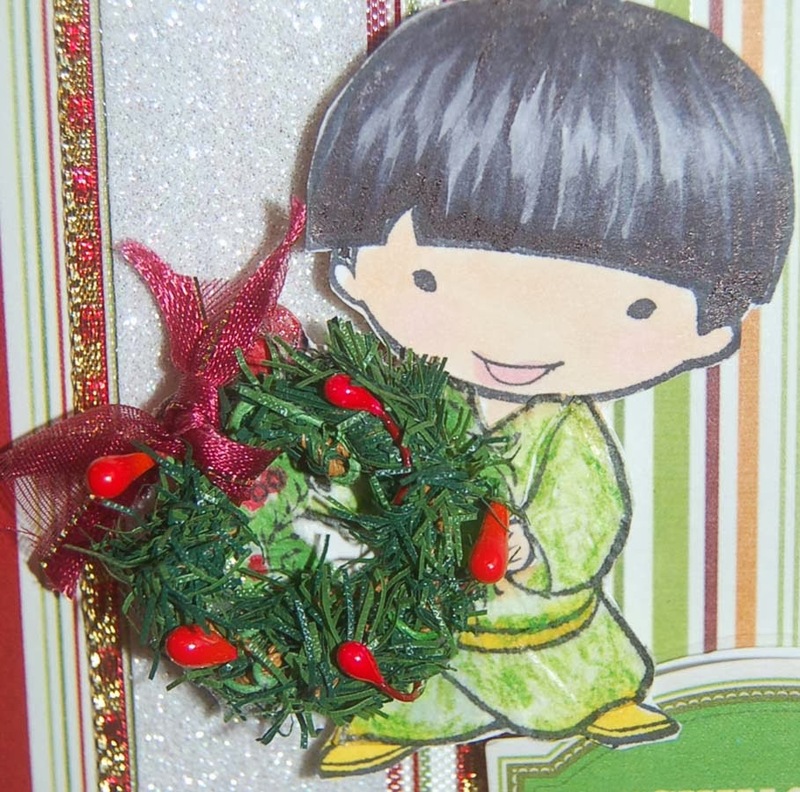 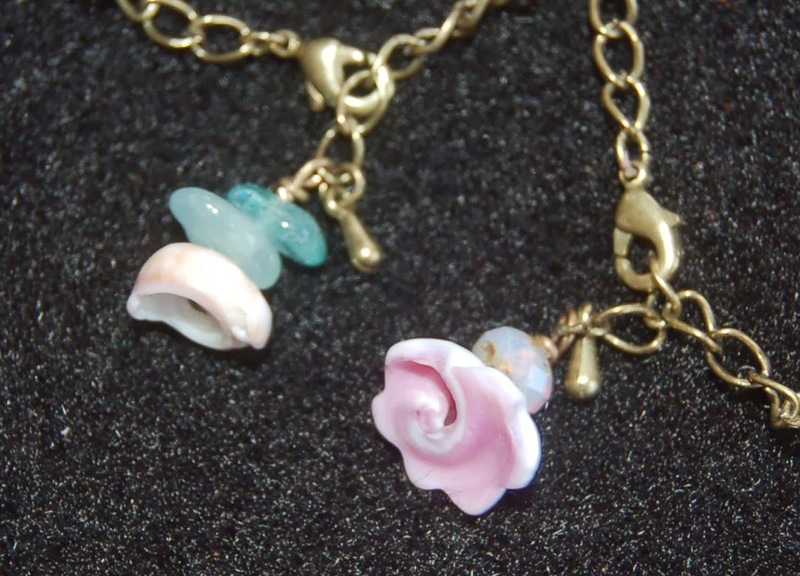 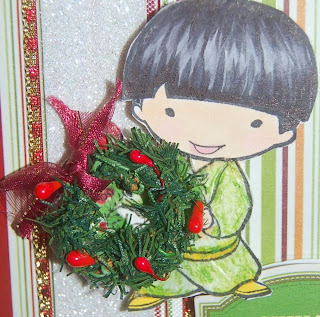 This close-up shows the AC ribbon and the bell charm zipper pull that I added for a little whimsy and to hint at the Japanese girl images inside the card. 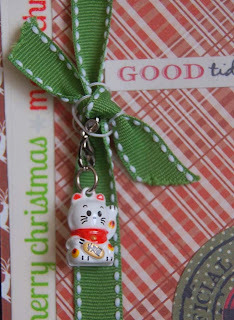 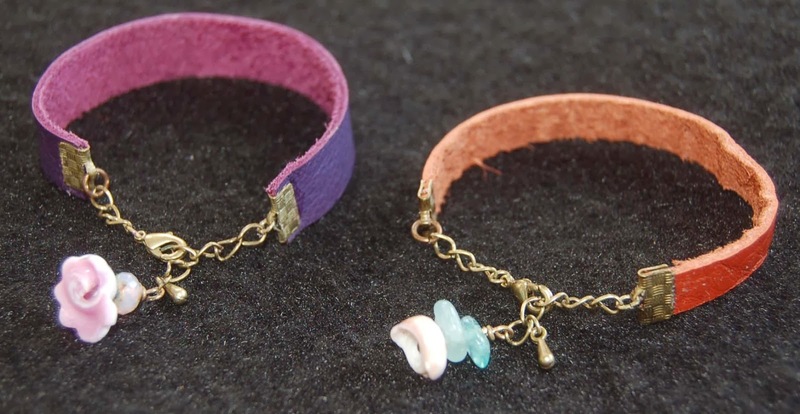 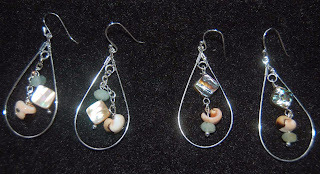 Also adding a zipper pull is a nice 'little' gift to someone with whom you don't exchange Xmas gifts. 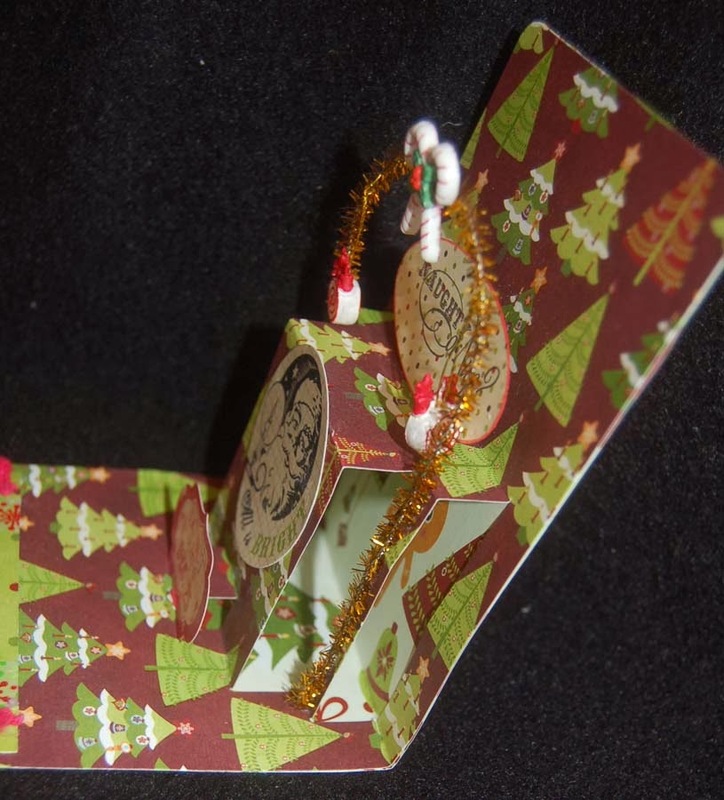 The side view shows the width of the pop-up platform and the small pop-up stand that I made and adhered to the back of the reindeer image. 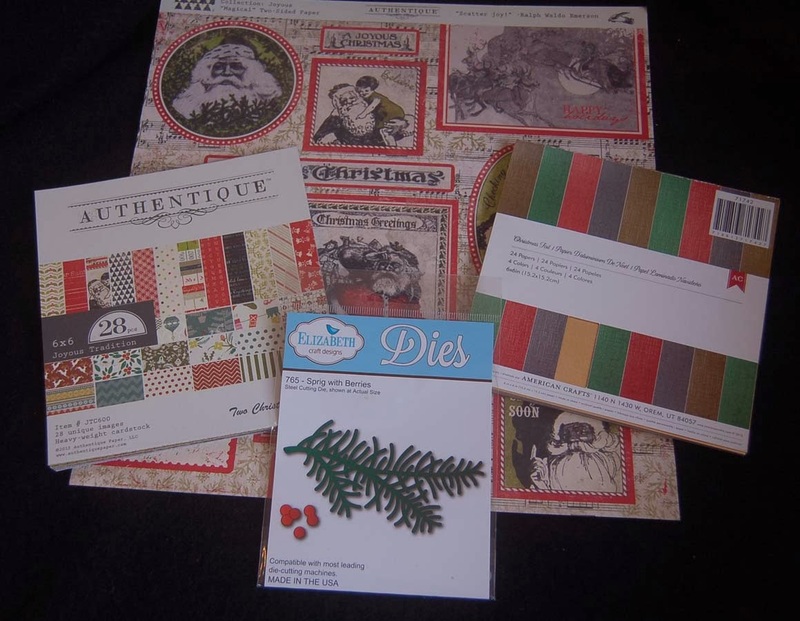 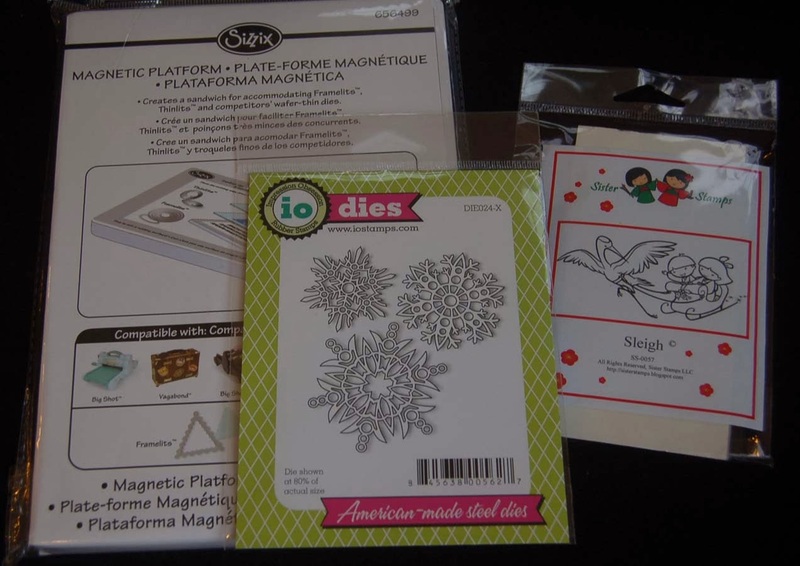 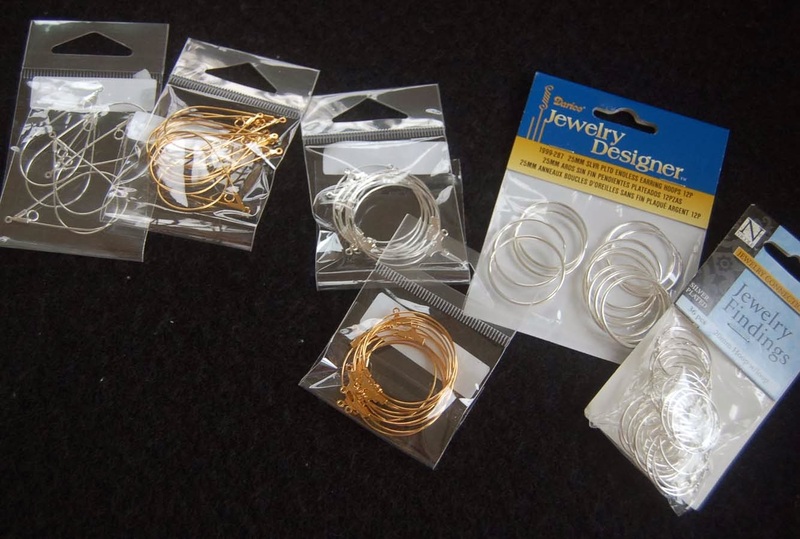 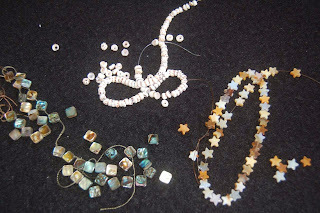 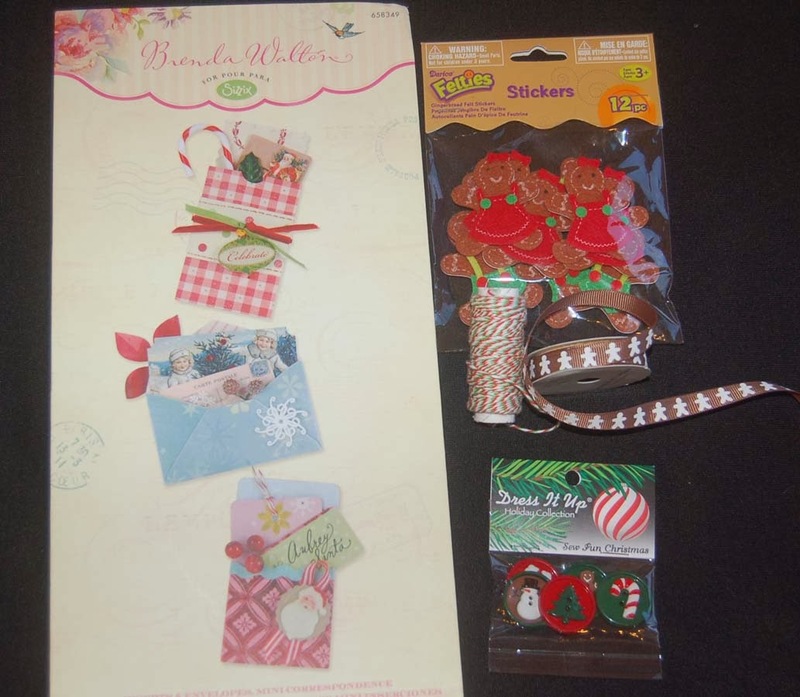 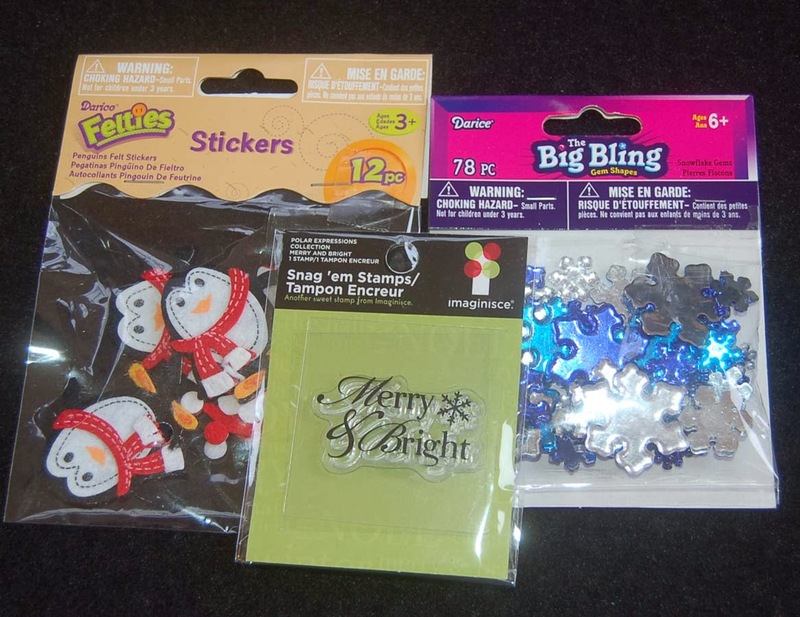 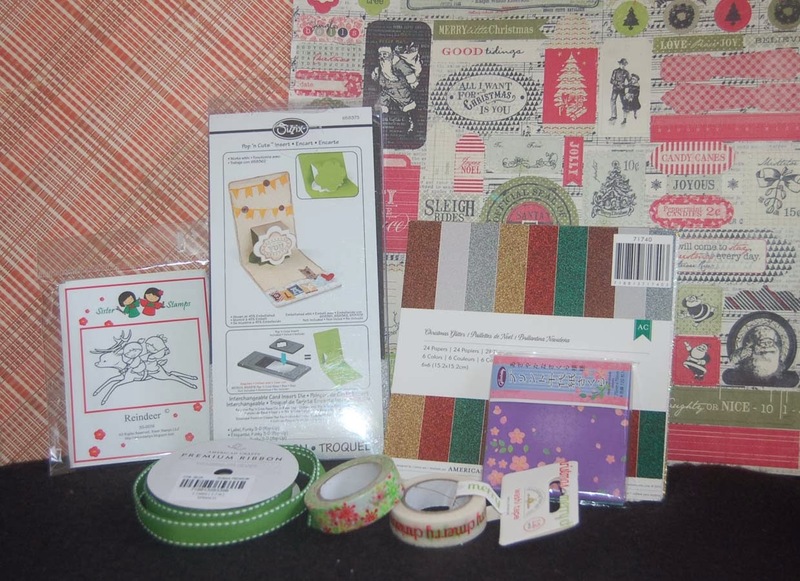 Here are the terrific supplies I used to make my first Christmas card of the season. 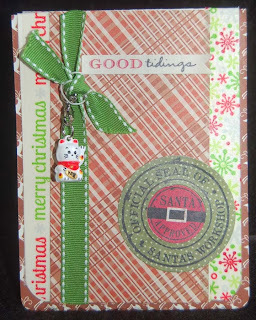 (I forgot to include the Studio G stamp reindeer with the sentiment.) 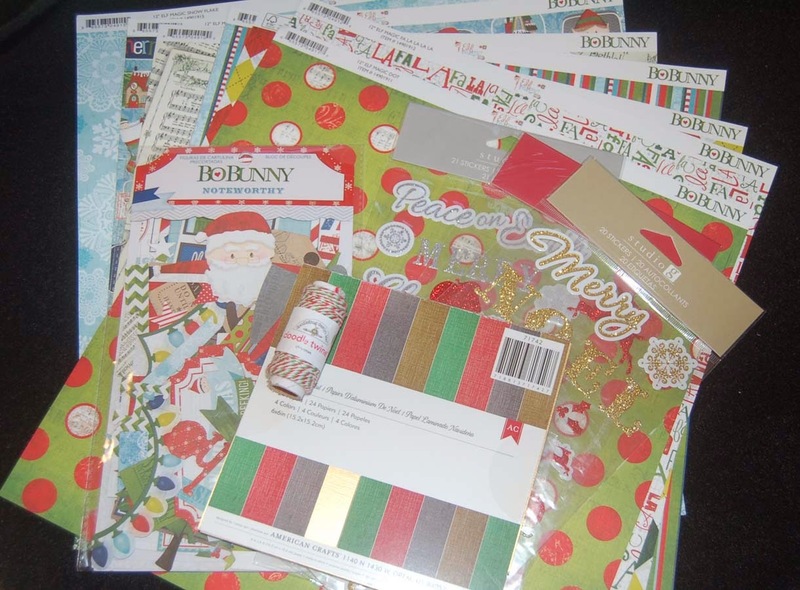 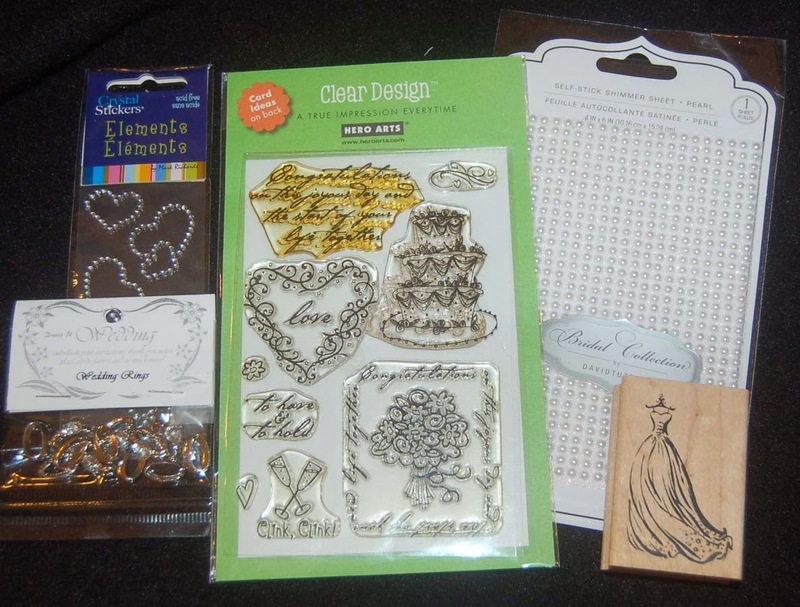 All of them were purchased at Ben Franklin Crafts and make me excited, speeding up my crafting. 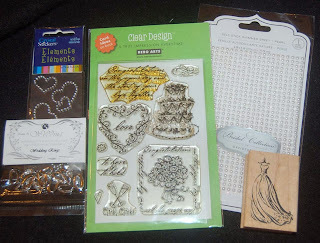 So many projects in my head and so little time to get them done. 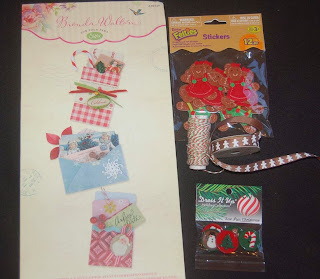 I think I was in the same predicament last year and I vowed to start seasonal crafting earlier....sigh. 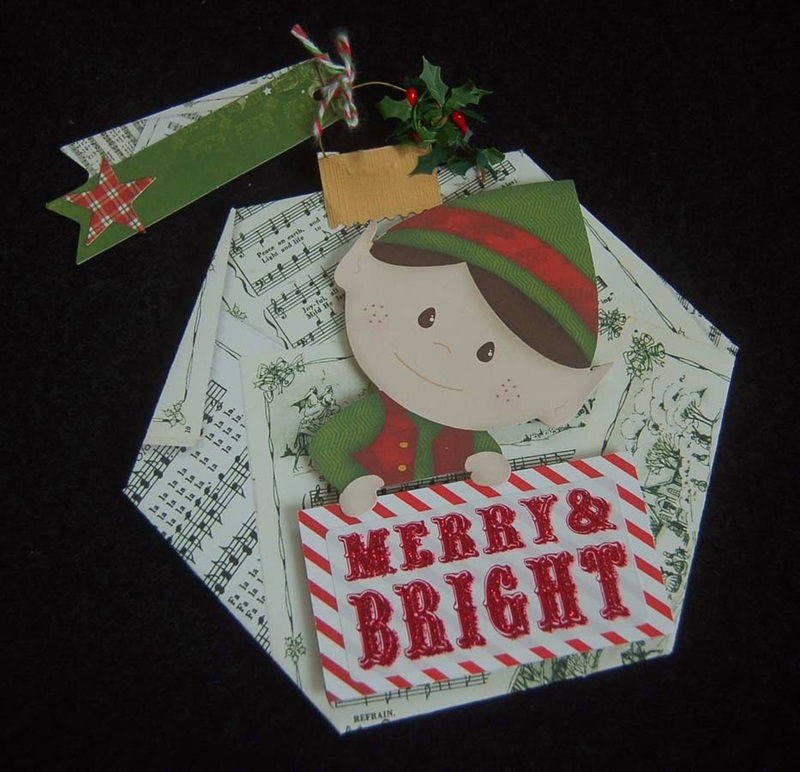 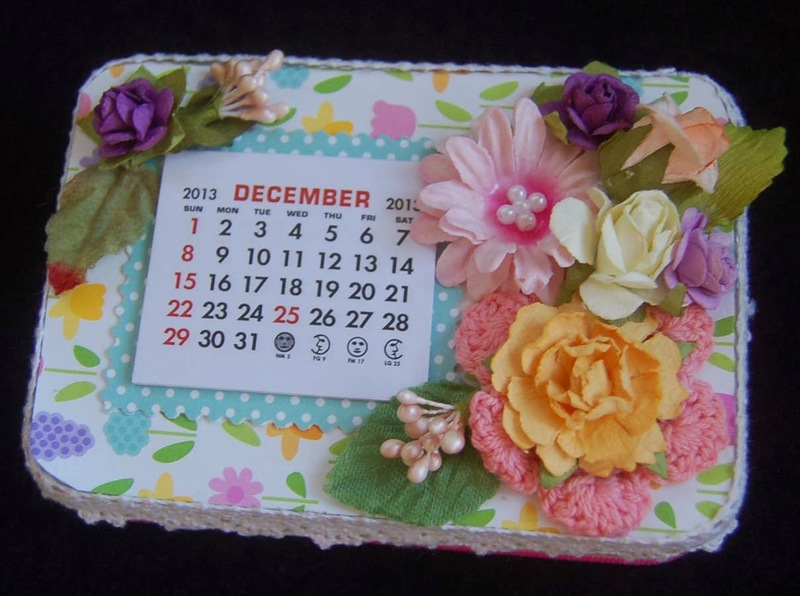 Hope your 2013 crafting has a light at the end of the tunnel! 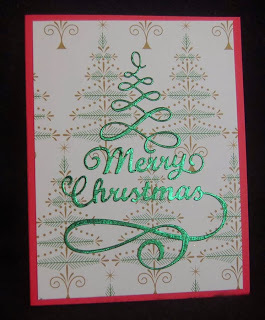 Thanks for making a stop here today. 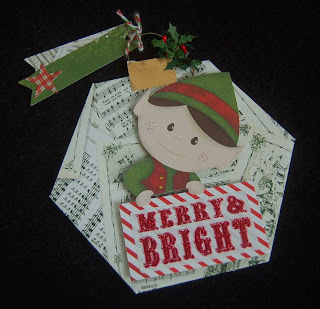 If you have time, I'd love a comment......every one is a precious energy boost.